Commercial Projects: Stairways, Inc. will have a spiral staircase that will work regardless of your application. 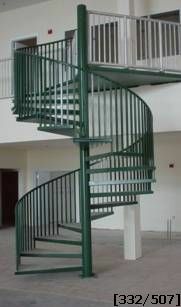 Our welded spiral stairs virtually have no limits - height, diameter, or material used. Office environments are generally hectic and can be noisy. No one wants to listen to foot traffic on spiral stairs. Stairways, Inc. can supply spiral staircase steps which can be inverted and filled with concrete on the jobsite. Traeting the spiral stair steps in this manner will reduce noise, and give you a safe non-skid surface. Contact Stairways, Inc. for more innovative and safe options for your spiral staircase needs.